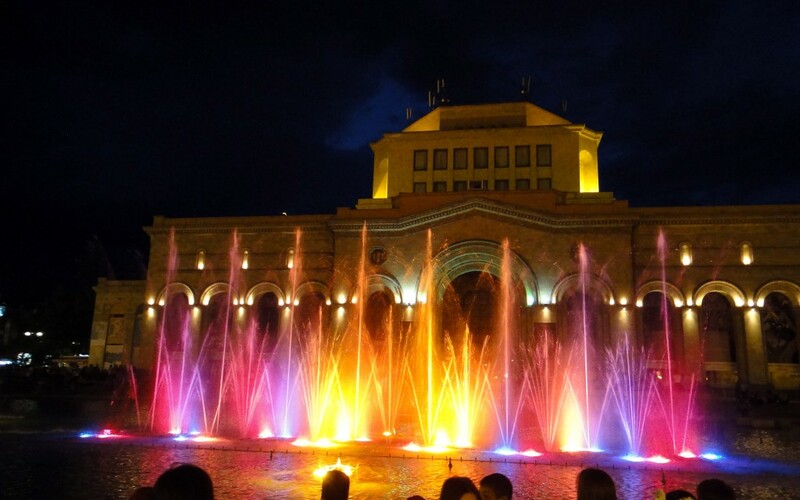 Yerevan is the capital of Armenia and by far the largest city in the country.Indeed with over 1 million inhabitants it has a third of the total population of Armenia. Yerevan has a very European feel to it– far more so than many towns in Turkey or in Middle East and it is miles away from Moslem countries such as Jordan or Pakistan. It is situated in the middle of the best agricultural land in Armenia, at the foot of Mount Ararat and very near the border with Turkey. It expanded enormously in the Soviet era, particularly in the 1930s and 40s as the Soviets encouraged the building of large cities and many people flocked to the big city. 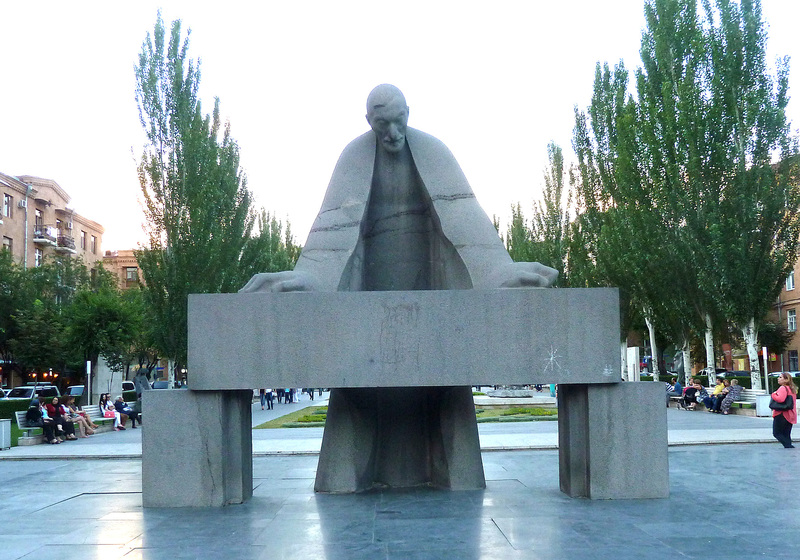 Many books on Armenia have a cover photo of a gnarled old man or old woman, very wrinkled and dressed all in black. 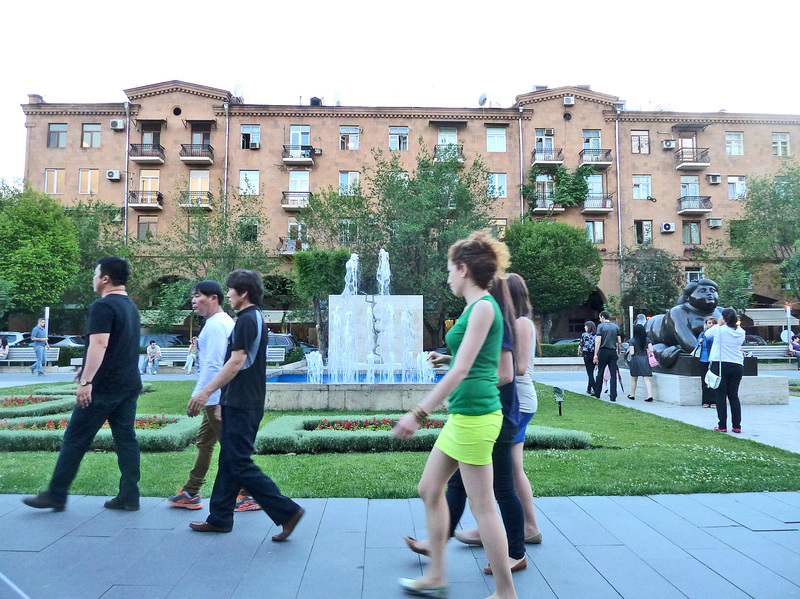 But I did not find Armenia like that at all. My memory of Armenia is that it was full of pretty young girls, like this young mum, strolling through Republic Square with her daughter. This to me is a typical photo of Armenia. Tamanian laid out the town around a central square known originally as Lenin Square, but which has now been redesignated somewhat unimaginatively as Republic Square. This has two design elements: to the left is the circular part, while to the right is a rectangular element. 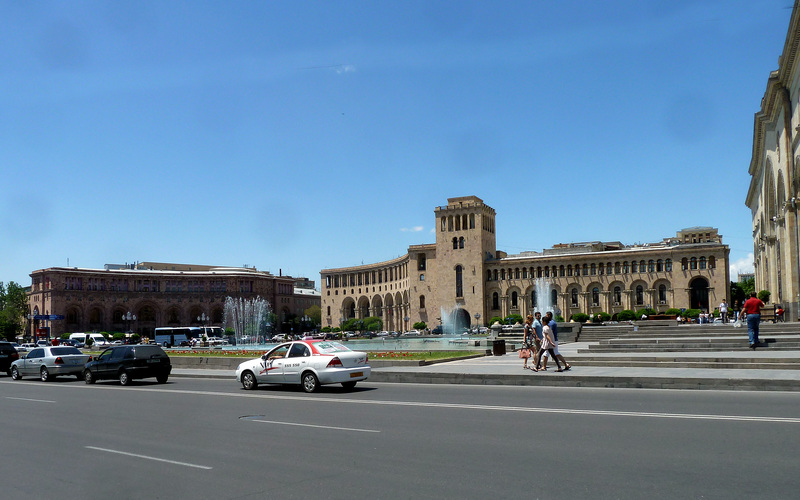 To the far right, and dominating the Square is the National Museum, seen below. Note the tower which marks the division between the circular part to the left, and the rectangular part to the right. 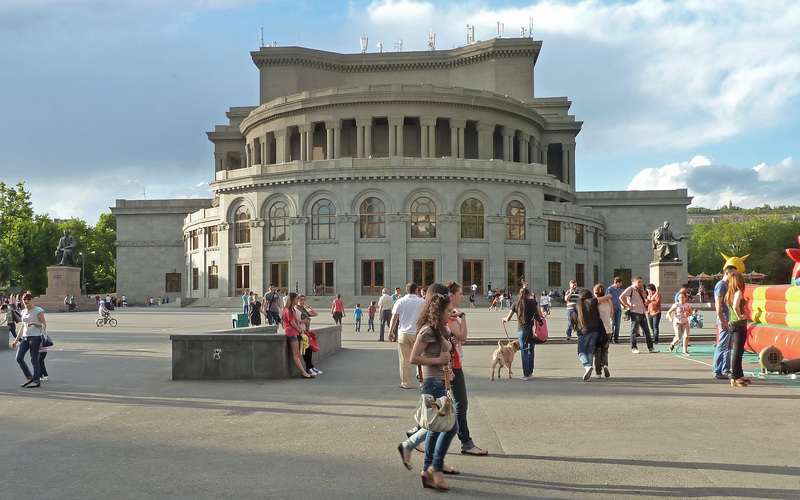 At the apex of Northern side of the lies the State History Museum: originally it was the Museum of the Bolshevik Revolution, but now it has a fine display of Armenia archaeology. The original Tamarian design was simply the lower storey, in his best neo-classical style: the addition to the centre at the back is a later addition, housing the national gallery. Fronting the State History Museum is a series of pools and fountains.At night the Fountains dance to music in a computer controlled display. Here we see the fountains dancing the Ride of the Valkyries.Behind it can be seen the ghostly outline of the National museum. To the north a broad avenue leads to the Opera House, considered to be one of Tamanian’s masterpieces. It is not perhaps to everyone’s taste – it is built in a somewhat uninspiring gray stone but it is surrounded by a large open area. Beyond the Opera House is the Cascade, approached by a wide ceremonial avenue. This is one of the grandest examples of Soviet spectacle, designed in the 1960s to mark the 50th anniversary of Soviet Armenia in 1973. The avenue leading up to the cascade is a dramatic statement, – though note the dwellings in the background are these ‘workers dwellings’? 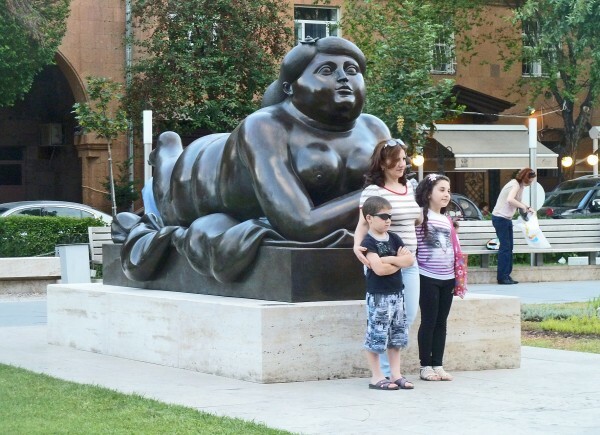 .I must admit that such a gross woman is not to my taste: but it is interesting that a family with young children is happy to pose in front of it. 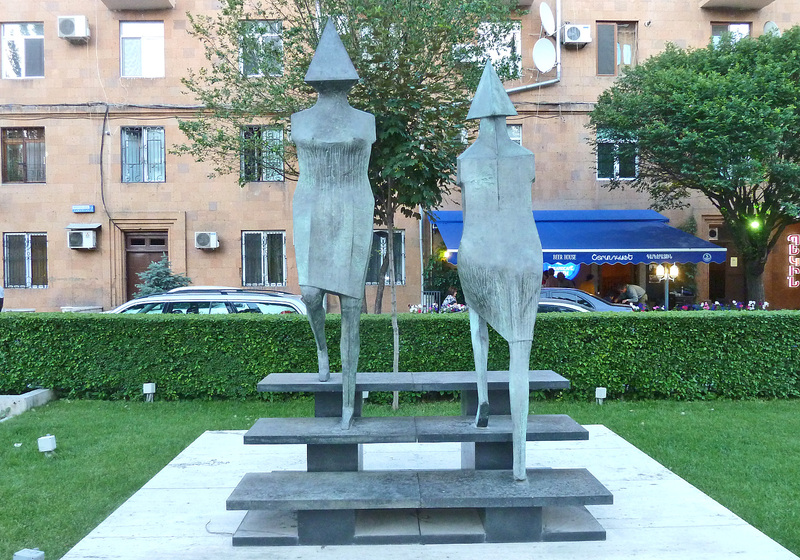 Almost opposite is as statue by Lynn Chadwick entitled ‘Stairs’. 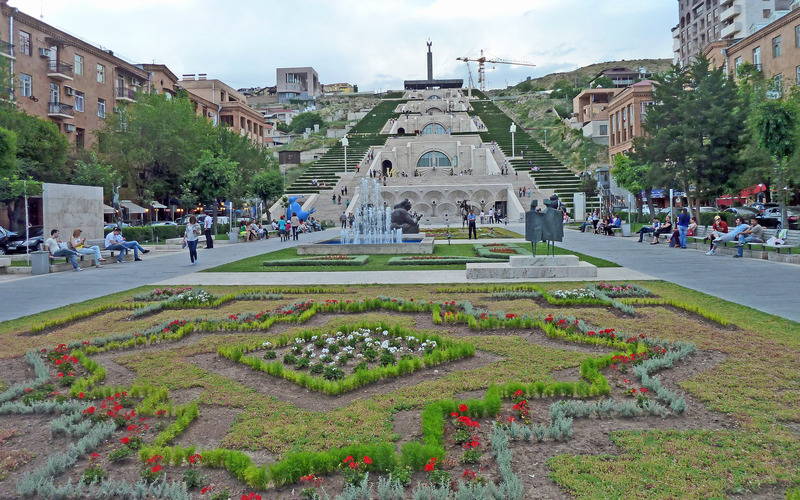 And here, at the join between the Cascade and the main city, is the statue of Alexander Tamarian by Artashes Ovsepian, looking down over the city that he had designed.This is very much like Wren, saying ‘Si monumentum requires, circumspice‘. 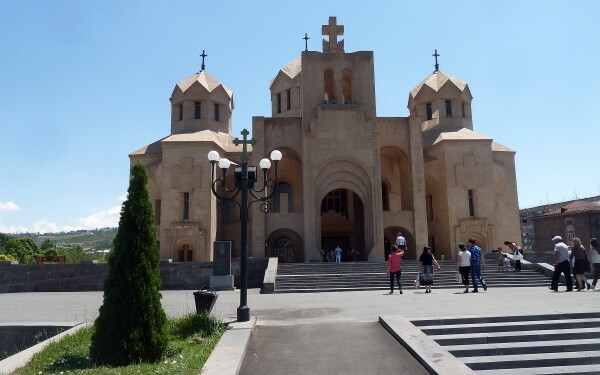 One of the latest additions to the town is the Cathedral built between 1996 and 2002, when it was consecrated to celebrate the 1700th anniversary of the adoption of Christianity as the state religion – t he first country in the world to do so, anticipating Constantine by 10 years. It is by far the biggest church in Armenia – far bigger than all the others. Right, as seen from the side. The cathedral is set on a low hill in part of the greenbelt envisaged by Tamanian in his 1926 plan. 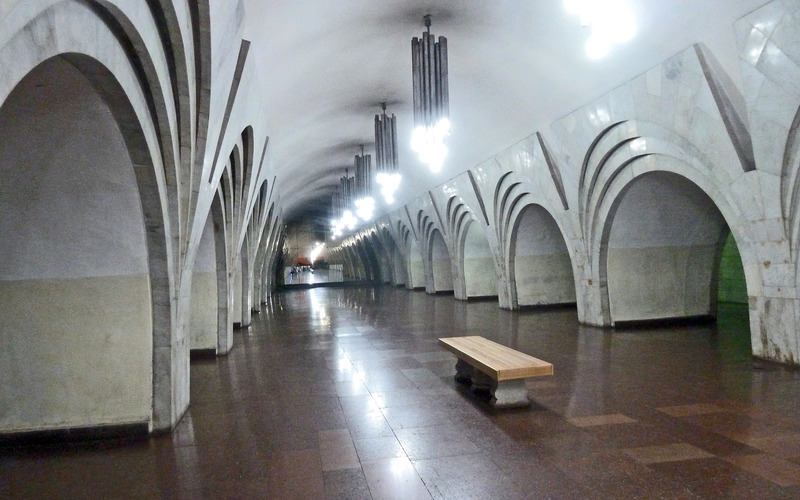 And here are two of the finest examples of Soviet architecture. Left is the railway station with its fine spire once topped by the hammer and sickle. 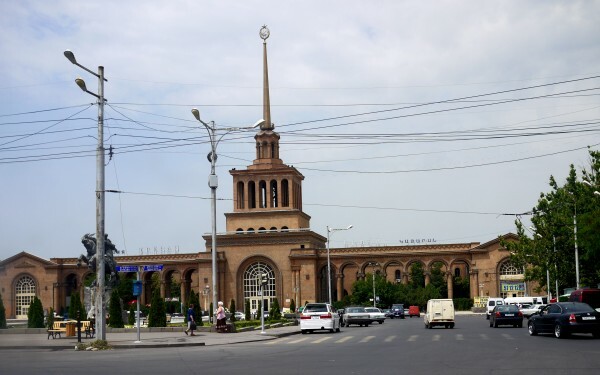 Today it is sadly forlorn, with only a dozen or so trains a day as the main railway network has been sabotaged when neighbouring Azerbaijan was cut off and all communication between the two countries has ceased. Right is the Metro. Admittedly it is only a single line running north to south but the main station at least is built with something of the splendour of the Moscow Metro. 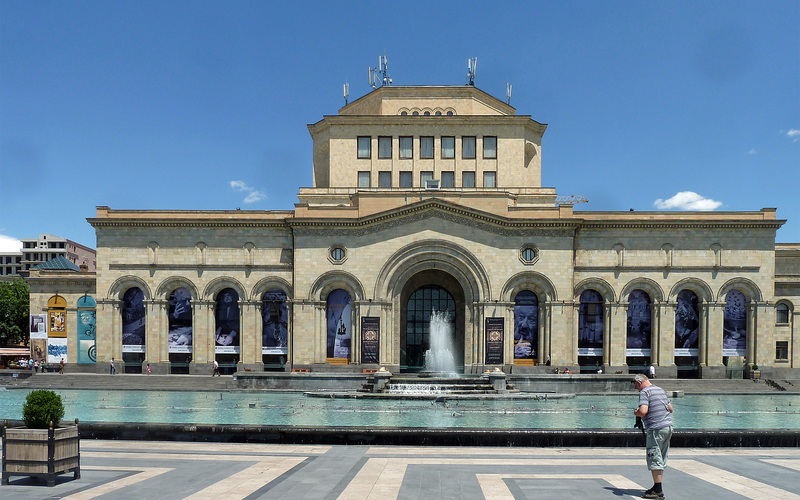 We went just one stop on the Metro – the only problem is that all the signs are in the Armenian script which sadly is incomprehensible to outsiders, so we had to ask some schoolgirls in which direction we should be going. 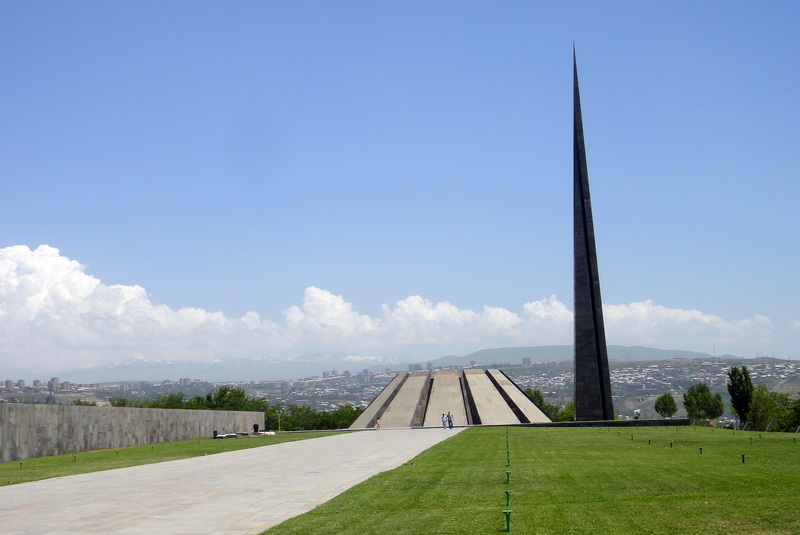 On the outskirts of Yerevan is one of the most important monuments, the Genocide Memorial. 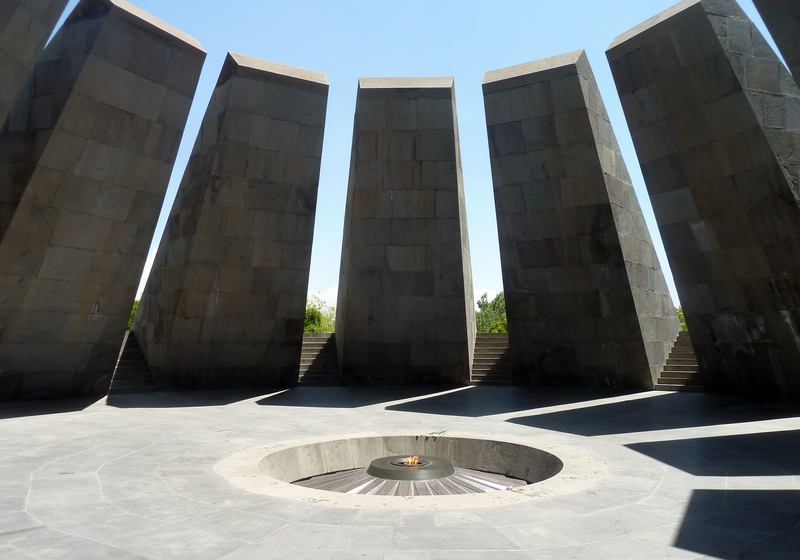 This is a memorial to the over 1 million Armenians who were massacred by the Turks in 1915. In 1915 the Ottoman Empire was crumbling, and the Ottoman Turks panicked. 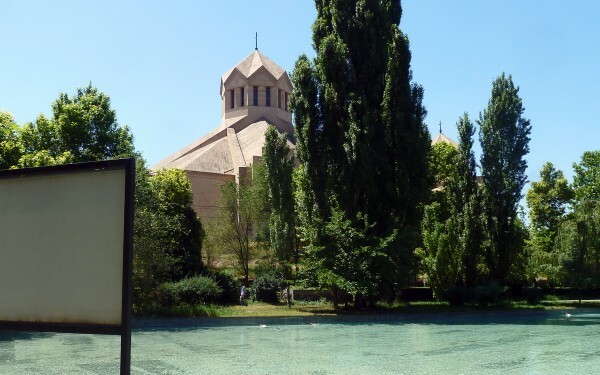 They realised that throughout what remained of their empire there was a substantial scattering of Armenians who were Christians, and therefore politically suspect. The Turks therefore decided to eliminate the Armenians. The women and children were sent on forced marches to camps in Syria but many of the men were simply massacred. Many escaped, particularly to America, where there are more Armenians living than in modern Armenia itself. Since they most come from what is known as ‘Western’ Armenia (=today eastern Turkey) they speak a Western Armenian dialect which is rather different to the Eastern Armenian dialects spoken in Armenia itself. In 1965, on the 50th anniversary of the genocide, mass demonstrations were held which led the Russians to commission the construction of a genocide memorial on a high point overlooking the city of Yerevan. It consists of the tall thin spire and a semi-subterranean monument – I would almost call it a ‘henge’ monument. Here we see the inside of the subterranean ‘henge’ with the sacred flame burning at the centre and 12 inclined pillars that represent the 12 lost provinces that make up Greater Armenia – only six being in Armenia today, the other six being ‘Western’ Armenia. Recently a Genocide Museum has been built, mostly underground, which displays some of the horrors of what took place.